That has to be so tough selling her first one. I’m a guy and even I have to admit it killed me to sell my first one, and selling my kids are just as tough. She’ll get over it soon but I know it was hard to forget the one that you used to be with. Horses are actually not just an animal, somehow it also acted as our best buddy. Rebecca’s situation makes me remember the time when I was in our Ranches in Texas. We know what it’s like to lose a best (horsey) friend at my place. It is never easy. This is my first time on your site. Great blog. Selling a horse is always tough especially if it is your “first” love. I am sure that Rebecca will always cherish her memories and should be thankful that Fred is being well taken care of! I know how hard it is to sell an animal that has been a big part of your life. 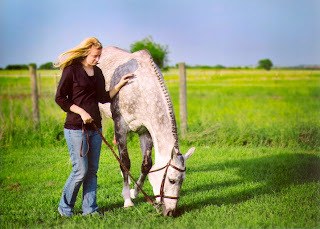 Maybe in the future Rebecca will be able to find another horse to enjoy when the time is right. Fisrt of all, I just want to say that I really feel for Rebecca.. It’s now almost a year since my dog (and best friend..) died. And I never thought I would be this sad for such a long time.. But those beautiful creatures really do captures our hearts..! (And by the way, the horse is really magnificent! Such a beauty). Now to my real question..! My name is Rikke and I am a norwegian girl who is born and raised in Sweden. I have, for at least the last 5 couples of years, had this dream about working and living on a ranch for sometime. And just by an coincidence I found your blog, and it’s really intresting and fascinating! I am intrested in both deleoping my english and learn what it is that you do for a living, and ofcourse to be of service and help. To really learn and use my body, to work hard. So, is there anyway you would consider to take in someone who’s had no experience at all of a “ranch life”?? I am just curius of what you guys have to say. Rebecca has always been good at living in the present. She has been sad anytime an animal she has cared for has died for some reason or another. One time her favorite palomino was in a scuffle with another horse while Rebecca was in the arena with them feeding them. The one horse kicked her palomino as horses will do. Well this particular kick caught her palomino right in the neck and was enough to almost instantaneously kill her palomino. Naturally, she was very upset even devastated at this. Especially she was right there when it happened. She has also lost several goats to mysterious illnesses (goats are notoriously fragile health-wise). She really loved her goats and spent lots and lots of time caring for them. She has shown an ability to rebound from these experiences in very short order. She’s upset but she picks herself up and moves forward. So losing Fred was a heart breaker, but he’s still alive and she knows he’s being taken care of by someone else. So she’s good with it. Do you wonder what Rebecca will remember from this experience? How will she apply what she took from selling Fred to her adult life?